While working with the Michigan Refugee Assistance Program, Brooke Bacigal met resettled refugee families from all around the world. Each family had at least one common desire: to make a better future for their children. 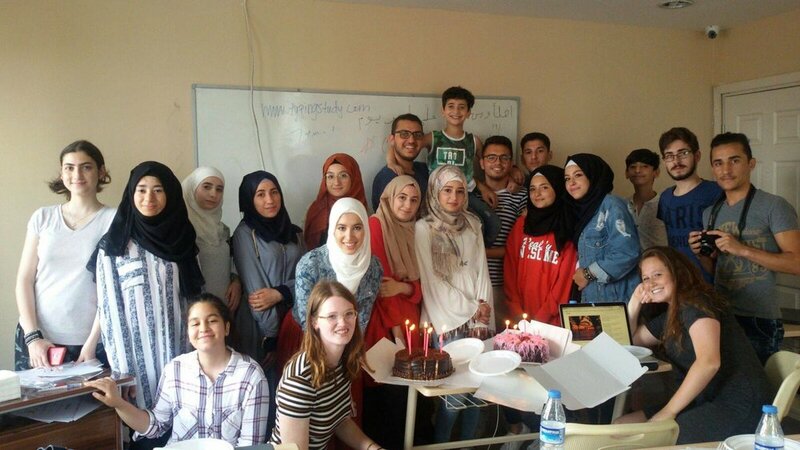 Because refugees resettled in the U.S. make up less than 1% of refugees in the world, she co-founded [RE]vive, a refugee education initiative that hosts professional development workshops in Istanbul for Syrian refugee students to help them expand their employment options. Brooke hopes to be able to say one day that every refugee camp and resettlement area in the world has adequate resources to provide the children who live there with a proper education. So far, she’s off to a great start. What inspired you to get involved with refugee assistance and education programs? Refugeedom is a consequence of circumstance – so, in theory, anyone has the potential to become a refugee. And while there are many different legal categories and terms, they all boil down to a person being pushed out of their home and forced to flee. Fundamentally, I cannot understand why someone who is the victim of circumstance deserves any fewer opportunities than you or I. Their status already strips them of their present, and without an education, refugees are also being stripped of their futures. Currently, I am fortunate enough to be at university. Yet less than 1% of eligible refugees have access to higher education. I was inspired to get involved because while refugees are already resilient, brilliant and bold, they are capable of the unimaginable when their creativity is catalyzed by empowering educational opportunities. How did you come up with the idea for [RE]vive? The idea for [RE]vive was sparked by a simple question: “What can we teach refugees that refugees actually want to learn?” That question could really only be answered by refugee students themselves. So, my partner and I reached out to organizations working on the ground with refugee students every day to identify the gaps in their knowledge. Unsurprisingly, refugee students abroad struggle with many of the same things students in America do: college applications, resume building, job interviews, etc. Out of that need [RE]vive was born, a professional development workshop series for refugee students abroad. What was the hardest part of getting [RE]vive off the ground? Starting anything is a messy process; it’s making something where there was nothing. And because there was nothing, and because people don’t like change, everyone is quick to tell you that it ought to remain nothing. And they will question every little thing. But how? Why like this and not like this? When can you even go? What makes you the best person to do this? And what exactly are you even doing? The hardest part by far was not dismissing these questions but instead answering them. Myself and my team had to seriously sit down and meditate on each and every question that bombarded us because, ultimately, it made the final product stronger. We made sure we were truly doing our work for the right reasons, and that we were using our resources as efficiently as possible. Where do you see the organization heading in the next five years? Hopefully, in five years [RE]vive will be on (at least) its sixth iteration of workshops and will have expanded to three new sites! After the completion of our first run we know where to focus our efforts and what we want to adjust and revise. Next, we need to begin incorporating student feedback and developing workshop #2, which hopefully will turn into workshop #3 and so on and so forth into the foreseeable future! What advice do you have for other young women looking to get involved with a great cause, or hoping to launch their own organizations? I’ve found that injustice evokes a strange emotion within people, stirring up their insides. It grows like a deep heat and envelops your stomach until your throat chokes up and your eyes well and you know, deep inside, that something has to change. When you find the issue or person or law that weighs on your heart and frustrates your mind, hold onto it. Don’t let your feet stay you from running to the hills and shouting about it to everyone you know. Don’t let your mind tell you that you alone aren’t enough to make a difference. Don’t give up when it gets hard - and it does get hard. Instead, reach out to those who have done it before, or those who have started. Talk about your work to everyone and anyone who will listen. Take a step and another step and eventually you will make strides toward tangible change and progress. A 20-something-or-other with an appreciation for the following: emergency medicine, lipstick, the suburban mother wine culture, commas, musical theatre and Taylor Swift. Catch her screeching along to the radio with the windows down or buried in blankets crying over overly-dramatic television; there is no in-between.